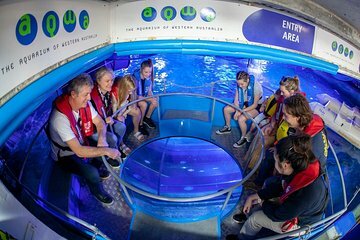 Look over exotic marine life from above during this glass-bottom boat tour that includes entry into the AQWA Aquarium of Western Australia. Set off to bob along the surface of a 1-million-gallon (3-million liter) tank to see turtles, sharks, and stingrays swimming below. In the aquarium, see a colorful coral reef and pass through an underwater tunnel where sharks swim overhead. Dress code is casual and must have enclosed footwear.